Posted April 9, 2019 & filed under Fun Stuff. Have fun and hope you visit Yellowstone National Park soon! Enjoy….. If you’re one of the 65% of Americans who believe in the supernatural, then you’re probably fascinated and intrigued by this possibility. You want to get up close and personal with the mysterious, so that it can feed into your writing. However, you’re unlikely to see a ghost wandering down Main Street. If you want to encounter a spirit directly, then you will have to venture out into ancient and sacred lands. One of the best places in the US for this is Yellowstone National Park. Numerous ghost sightings have been reported from here and they have been the inspiration for many stories. 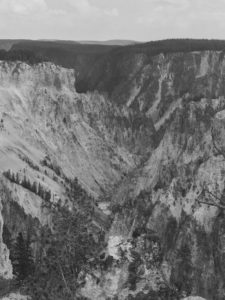 If you are a writer of mystery, then heading to Yellowstone can allow you to experience the supernatural for yourself and help you to craft more believable tales. Ghosts are said to inhabit all areas of Yellowstone, but one place has had more sightings than anywhere else: Old Faithful Inn. Built in 1903, this is one of the oldest buildings in the area and it has a rich, but terrifying history. The most famous deceased guest, who never checks out, is the headless bride. She was found in the hotel in around 1915, decapitated in the bathtub. To this day, she walks up and down the stairs throughout the night, her head tucked under her arm. If you are brave enough, you could stay in room 127, where the murder is said to have taken place. Are You Brave Enough to Camp? Yellowstone is famous for attracting avid nature lovers, who enjoy being close to nature. The geysers and volcanoes make for spectacular scenes that are unmatched by any other national park. However, another advantage to camping outdoors is the possibility of encountering a spirit. Around the hot springs, you may observe the spirits of those who were killed. For instance, in Lower Falls, it is possible to hear the chanting of Native Americans who drowned there in 1870. Then there are the ghosts of the eight people killed by bears since 1872. Camping among all these spirits isn’t for the faint of heart, but it is sure to provide stories which adventurers can later write into thrilling novels. That’s assuming you make it out alive. Yellowstone can be an unforgiving environment, so make sure you have a good set of outdoor clothes and some survival gear. This is essential, even without the presence of ghosts. If camping, make sure you are not alone and have communication with the outside world. You may want to bring Ouija boards or similar equipment to entice a ghost, but make sure you practice this in a safe environment first. Tread very carefully and bring experienced spiritualists to ensure your safety. Yellowstone National Park is sure to get your creatives gears going. Whether you believe in spirits or not, there are so many fascinating tales to draw inspiration from. Spending a night in a creepy lodge or wild camping will help you to experience the thrill and adrenaline of a mysterious experience. This will feed into your novels and short stories, making them all the more believing and captivating.